Neptune was the first planet to be discovered not through observation, but by predicting its existence using calculations based on the universal theory of gravitation. It looks like a twin sister of Uranus, having the same blue-green tint and a similar size, density and structure. Its rocky core is surrounded by a layer of ice and a gaseous envelope of hydrogen, helium and—in the upper reaches—methane. 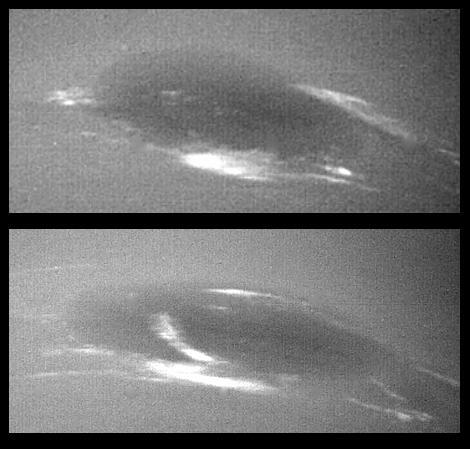 Neptune’s surface relief reveals a surprising amount of atmospheric activity, with violent winds (of) up to 1,000 kilometres per hour, numerous clouds, and rapidly moving air turbulence. It is encircled by 8 highly erratic satellites and by a system of rings, some of which are strangely incomplete and known as the “arcs of Neptune”. The furthest gas giant from Earth, Neptune’s year is 164 times longer than ours which means it still hasn’t completed a full revolution of the Sun since its discovery in 1846. Etymology: Son of Saturn and brother of Jupiter and Pluto, Neptune was god of the sea in Roman mythology. Discovered: In 1846, by the German astronomer Johann G. Galle using calculations by Urbain Leverrier. Distinctive feature: Neptune was the furthest planet from the Sun between 1979 and 1999, due to Pluto’s highly erratic orbit. Typical one-way journey time to Neptune using current technologies: 11 years.